It’s a Ninja Costume for the Paper Dolls! And now you all know how to get past my defenses. Now, I don’t know anything about ninjas, but I do have a fear friend who is a talented marshal artist. So, I hope she will forgive my badly drawn katana. One of these days, I’m going to get better at drawing katanas, but that isn’t going to be today. I wanted a ninja costume design that was interesting and also felt layered- the sort of thing you could imagine someone adding to as they had lived in the outfit. When I work in all black, I worry about the paper doll ending up looking “dull” and sort of lifeless. I love how flat color looks, but it can also look… well.. flat. I don’t know if that makes any sense. So, I try to add depth by using several shades of the same color. In the case of largely black sets, I try to use several shades of dark grey and then another color if I can. In this case, I added in some dark navy blue to accent the black. I thought about using red, which you see a lot in ninja Halloween costumes, but I thought it was too bright against the black. I did use a bright purple base though, because I do love color. Of course, if you want a more colorful ninja there is the black and white version and you can color that one anyway you want. If you follow me on social media or are a Patron, you may recall seeing this set along with my knight armor when I posted a sketchbook picture at the beginning of the month. 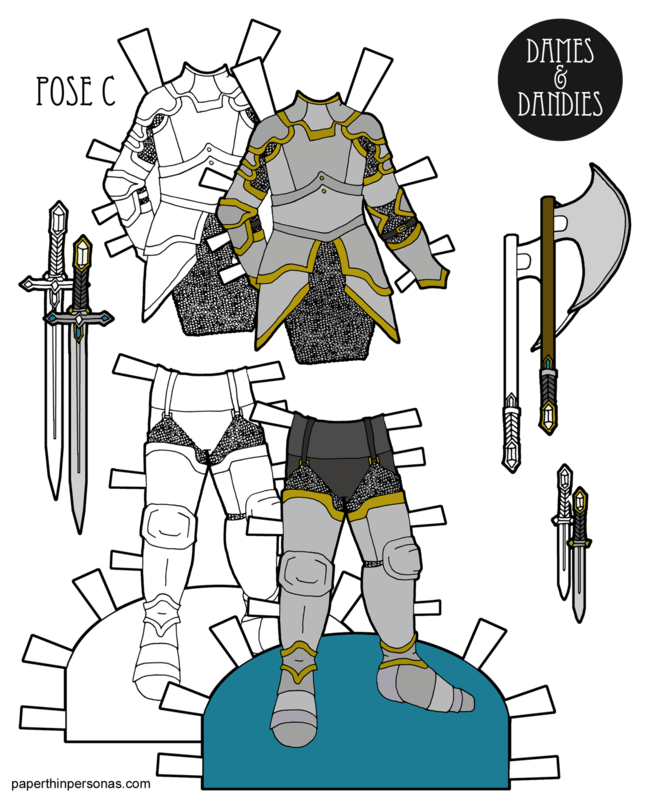 Printable Black & White PDF Printable Color PDF More Paper Dolls & ClothesFull-plate armor like today’s paper doll outfit is always a bit stressful for me, because I want it to be functional and I know pretty much nothing about how actual armor works. I mean, I get the basic idea- wear metal on your body so you don’t get hurt when swords try to stab you- but I’m not exactly fluent in the nuances. Still, it doesn’t bother me much when I design things that may or may not be practical (this armor comes to mind), so I guess I shouldn’t worry about it too much. If you’re interested in seeing how a paper doll outfit kinda “comes together” I did post progress pictures of the “bottom” part of this armor being drawn in my Instagram stories. That was a while ago, but as I’ve said many times. There is a long turn around from idea to finished product. Literally weeks in most cases. Sometimes even longer. Part of the reason things take a while to get from sketchbook to blog is that I like to work in batches. Today’s C Pose paper doll outfit is one of six I recently finished. Since I’m posting three times a week and interspersing my C Pose content with outfits for the A & B Pose ladies, it will be a long time before I get all of that material posted. Frankly, I couldn’t function any other way. I’m constantly impressed by people who can do things once a day for a prolonged period. The only way I survived my recent #100dressproject on Instagram was by drawing two to five dresses at a time. I tried to do the whole “one a day” thing, but that’s just not how I work best. This used to bother me, because you read so many things about how you should just have a “daily art practice”. I do work on my art everyday, but once I feel like I have to do it than somehow my motivation disappears like a ghost at dawn. Anyhow, if you like the blog and want to support it consider donating through Patreon. A dollar a month really does help off set my costs. And if you’d like to give me some non-financial support, comments are always lovely. Plus, Happy Labor Day to anyone whose celebrating. 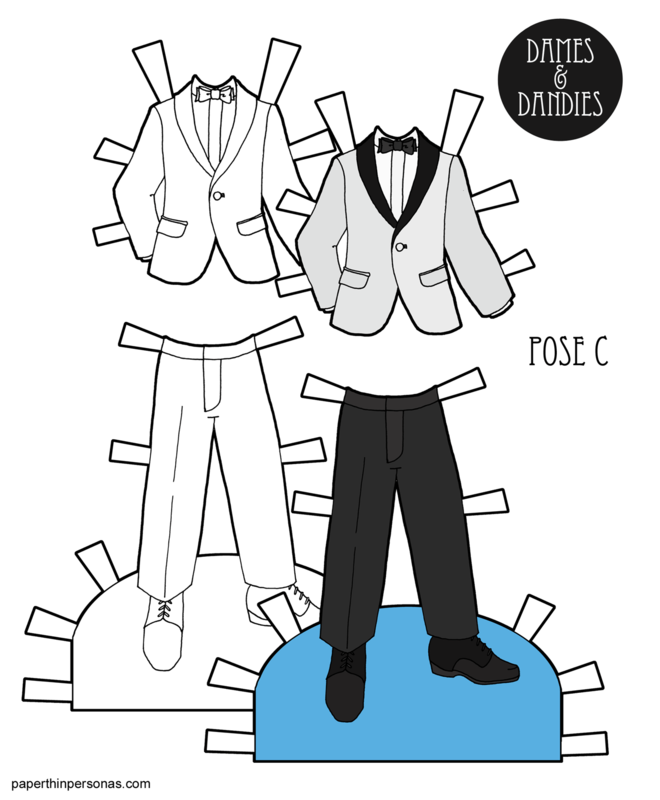 You may have noticed that there’s no color version of today’s paper doll set. 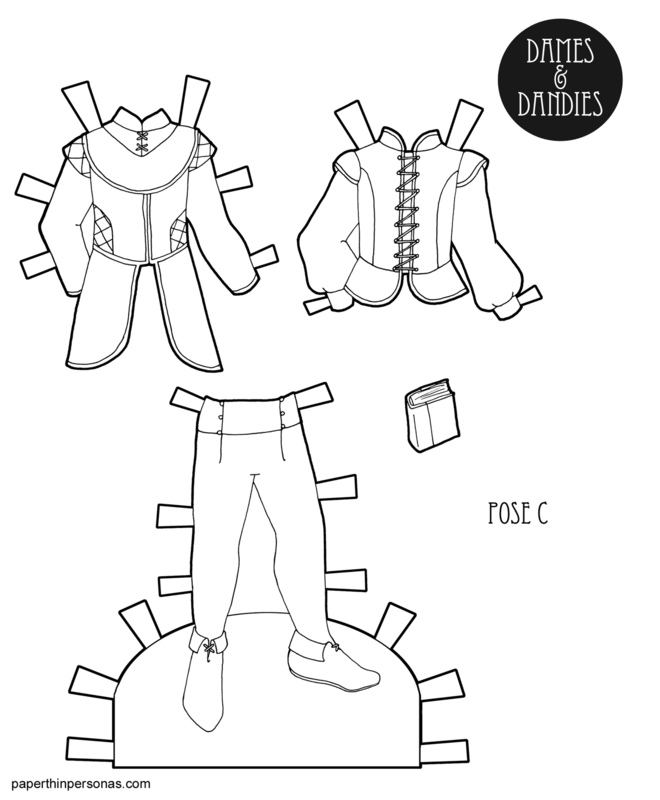 That’s because I thought it would be fun to do a week of coloring page printable paper dolls. Sorry, I realize that phrasing doesn’t really roll of the tongue. Of course, you can always print the paper dolls in black and white (as well as color), but I thought it would be fun to just do some plain black and white sets. When I am designing a paper doll coloring page printable, I am thinking a little differently than when I am working in color. In this set, for example, I wanted to leave space for people to draw their own patterns on the clothing if they wished. 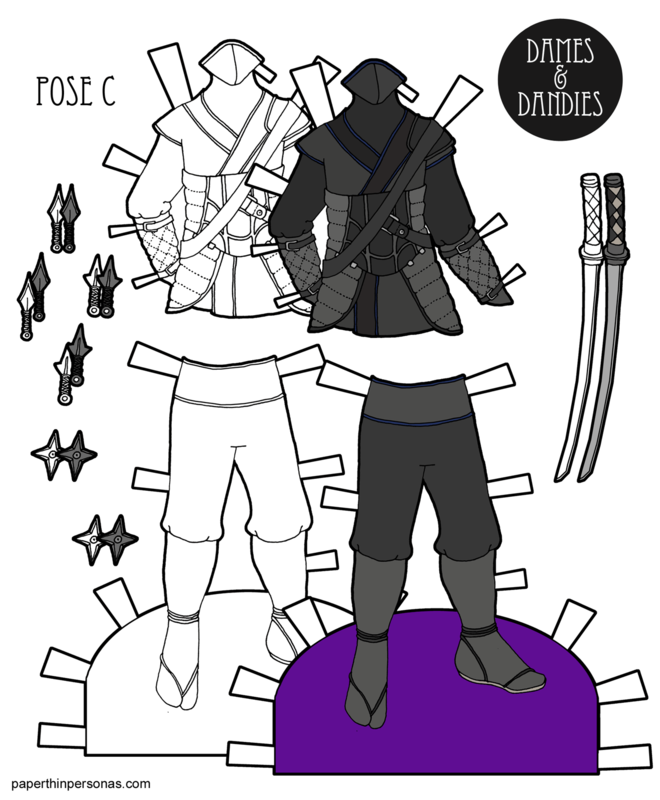 So, for this whole week, it’s paper doll coloring pages. Today there’s a C Pose set. Wednesday there will be a B pose set and we’ll wrap up on Friday with an A pose set. I’ll confess that I was never much into coloring when I was a kid, but I know a lot of people really enjoy it and find it super relaxing. I find inking relaxing, so I suppose I can understand the instinct. Let’s talk inspiration. I was inspired by three different images I found on Pinterest. I try to find similar silhouettes to make up a set like this so it feels like all the pieces belong together. I was inspired by this jerkin, this vest and this outfit. You can see more men’s fantasy clothing in the Gents section of my Fantasy Clothing Pinterest board. Love today’s paper doll coloring page? Hate the idea of a paper doll clothing page? Let me know in a comment. I’d love to see what people think of my coloring pages week. Every guy I know from my brother-in-law to the students I supervise seem to live in shorts and t-shirts. In the South, this seems to be a year around even when it is snowing. 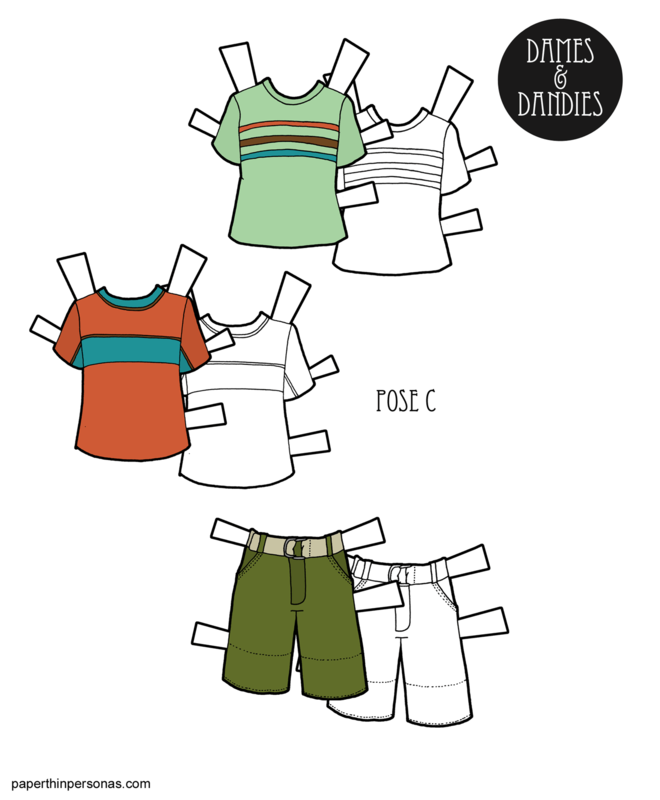 This is the third shorts set I’ve done for the C pose paper doll men. There was the 4th of July set and this set from June. So, I am going to keep this post short as I am trying to slip it in under the wire of Midnight Central time. Here’s a link to the second color scheme I created on my Patreon page. It’s available to anyone to print and play with. Meanwhile, let me know what you think of today’s paper doll in a comment (I love to hear from y’all) and consider supporting the blog on Patreon if you want to help off set the costs of keeping it on the internet. Tune in Monday for the first dress from the 1920s! It’s super cute. 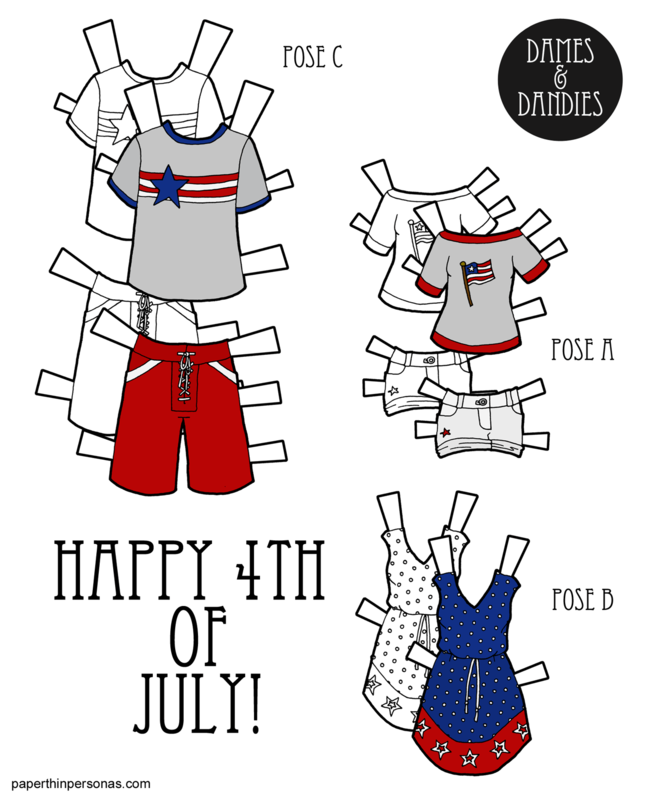 4th of July Paper Doll Clothing! Happy 4th of July to those who celebrate! I am back home in Alaska for the 4th and I am very excited about it. There will be fireworks at 12:01am on the Fourth, because it doesn’t get dark until then in Alaska. I am very excited about that. There’s always a big bon fire on the beach as well. I decided to do a set of contemporary summery clothing for my 4th of July themed paper doll clothing set. 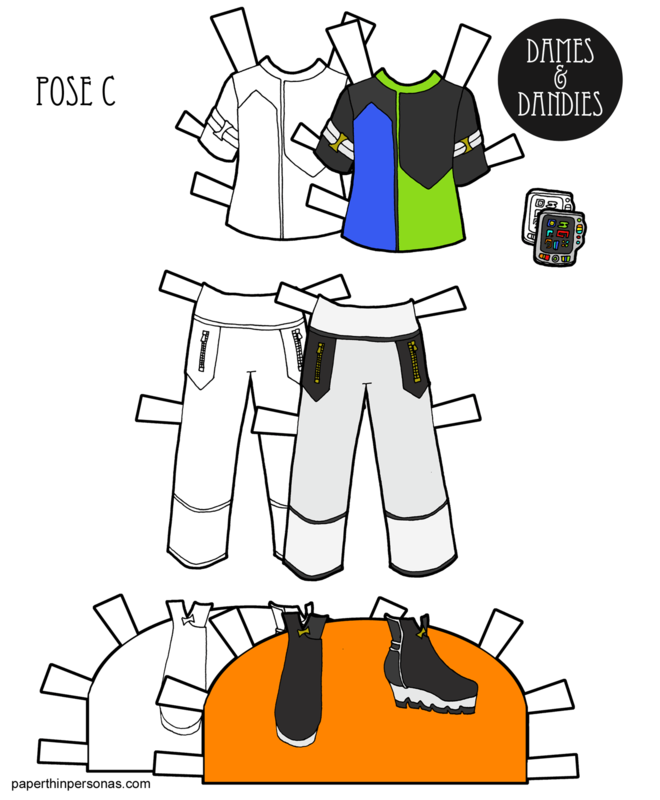 I realized quickly that shorts and a t-shirt didn’t seem like quite “enough” so I drew an outfit for each of the Dames and Dandies paper dolls. For the A pose, I did shorts and a boat-necked shirt. For the B pose, I did a blue dress with white polka-dots. For the C pose, guys I drew surf shorts and a t-shirt. All summer time clothing. Anyway, enjoy the 4th of July if you are celebrating (or just have a wonderful Wednesday) either way!